Currently preparing for an Elite Under-19 League semi-final against Shamrock Rovers this Sunday, both John Quigg and Hugh Harkin will be hopeful that members of their squad will not be required to join the first team as they travel to Limerick this Sunday afternoon. “I personally do not wish to disturb the preparations of the Under-19 side for their big game in Maginn Park, but much will depend on how we are after the Bray match,” declared Peter Hutton. 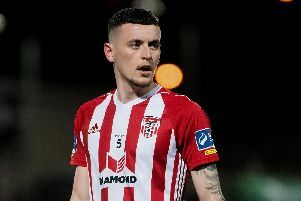 “With matches against Bray, Limerick this Monday night and then Bohemians next Friday night, we’ve got to manage the squad and our rest periods. Hopefully, we will not need any of the ‘19’s’ to travel to Limerick,” added Hutton. Wingers, Josh Daniels (ankle) and Stephen Dooley (back) remain ruled out while Shaun Kelly received an injection in his knee this week and will not be involved over the next 10 days. Commenting on tonight’s game, Hutton dismissed suggestions that his side would be strong favourites to secure another home victory. And Hutton again heaped praise on those supporters who backed his side against Sligo and Shamrock Rovers after the heavy defeat in Turner’s Cross. “We’ve come through a very difficult opening series of matches having played all the top teams and while we did let ourselves down at Turner’s Cross, the players have battled back. “On that front, may I extend my personal thanks to those supporters who have turned out to support us after we let ourselves down in Turner’s Cross.